There have been many threads over the years talking about what flash duration is, its importance in freezing a moving subject, and how to achieve the shortest flash duration possible. Hopefully this will combine all of this information into one place instead of searching through all of the posts to find the information you need. I am not going to get into the flash durations for all the strobe manufactures and their different models of strobes. That would make this article way to long! I believe that you the user of the strobes should research what the strobe manufactures have to offer, not only in their flash durations but what type of reflectors and light sources are made for the strobes and even what you might need accessory-wise, if you were to use the same strobes for portraits or even commercial work. Then make your decision based on the whole package and not just on flash duration alone. The duration of a flash discharge defines the ability of the flash system to capture or 'freeze' a moving subject. There's a longstanding debate continuing as to how it should be measured. The intensity of light given off by a xenon flash tube isn't constant through the duration of the discharge. When a fully charged capacitor starts to supply energy to the tube, the light output rises to a maximum very quickly indeed. As the capacitors start to discharge, the light output starts to fall, quickly to start off with, then more slowly as the energy is finally exhausted. In theory, the total flash duration should cover the entire period between the flash being triggered and the total extinction of the tube. Because of the shape of the flash curve - rapid rise, rapid fall, then a slow discharge at the end or 'tail' of the curve, it isn't practical to use this total time, especially as the light energy at the tail of the curve has little practical effect on exposure. Instead, manufacturers who follow ISO and DIN standards use the T.5 standard, which defines the duration of the flash to be the time during which the flash intensity exceeds 50% of its peak value. This gives a good basis for comparison between different manufacturer's units, and most studio flash units have T.5 durations of between 1/250 and 1/2,000 second. 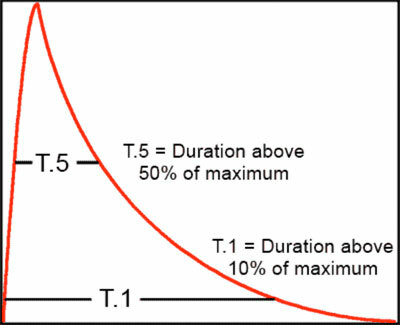 The T.1 definition, defines flash duration as the time during which the intensity exceeds 10% of its peak value. Generally, the T.1 flash duration is about three times as long as the T.5 value and this can be used as a reliable guide to the motion stopping ability of a flash unit. This motion stopping ability makes flash duration one of the two most important elements when shooting a moving subject using strobes since most digital cameras will only sync up to 1/250th. 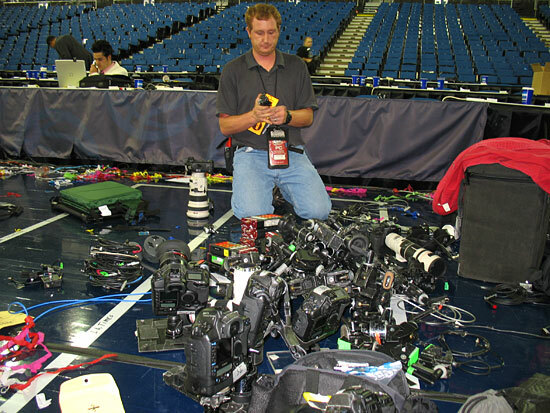 It makes no difference if you are in a studio, a sports arena, or shooting outdoors. The other element that we need to consider is the amount of ambient light that is present. To be able to freeze a fast moving subject you will need the power of the strobes to be great enough to exceed the ambient light by almost 5 stops and still maintain a short flash duration of at least 1/1000th. If you are installing strobes in an arena with good ambient light, 1/800th f2.8 @ 1250 ISO, your strobes will need to meter at least 1/250th f5.6 @ 100 ISO. Depending on the strobe type that you are using you might need to have your strobes turned up to full power which in turn will lengthen the flash duration in order to obtain the 1/250th F5.6 @ 100 ISO meter reading. Do you then add an extra set of lights and turn them all down to half power in order to get the faster flash duration and still get the 1/250 F5.6 @ 100 ISO reading, or would the presence of motion blur be acceptable creatively? If you are shooting a fast moving subject outdoors, you will need a lot of power to exceed the ambient light by almost 5 stops, and do you want the amount of depth of field that comes with this much power? These details and others such as catwalk height or time of day need to be thought about before lighting an arena or shooting outdoors. Studio type power pack and head combination will have the fastest flash duration at their lowest power setting. This type of strobe unit uses what is called Capacitor Switching. This method uses the ability to switch flash capacitors in and out of the circuit. When half of the capacitors are switched out, the power drops to half of its original power and the flash duration is also decreased by half. Adding more strobe heads to the pack can also shorten the flash duration. Adding another strobe head to the power pack the power will be cut in half and the flash duration will be cut in half as well if you use it on the same capacitor as the original strobe head. Not all strobes have shorter flash durations at lower power settings. Rather than cutting out capacitors entirely, some popular monoblock strobes reduce power by varying the voltage to which the flash capacitors are charged, therefore allowing for a relatively wide range of power control without compromising the full power flash duration. This is known as Variable Voltage Control. There is one other type of strobe to consider, the on-camera flash, which uses Thyristor Control. The thyristor in these flashes will quickly shut off the flashtube according to the power level of your choice and results in the elimination of the tail in the flash duration curve. All of this illustrates the importance of learning how your equipment works, and what effect altering power settings has on flash duration.